The festive season in Manchester was welcomed in at a spectacular outdoor event held at the Town Hall, Albert Square on Thursday evening. A show featuring dancers, singers and Pantomime characters was presented by Piccadilly/Key 103 radio personalities. 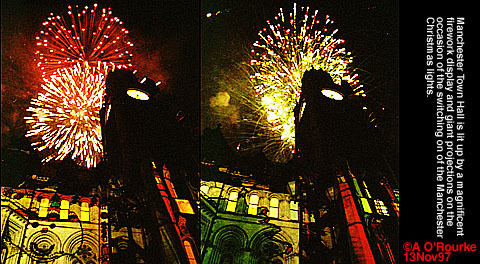 A large crowd of clapping, cheering Mancunians of all ages watched the event, which reached its climax with a stunning display of fireworks above the Town Hall clock tower. This year the Council have decided to light up the 124 year old building using high power projectors which throw a changing pattern of snowmen, Christmas trees and other festive designs across the facade. After the fireworks, a small parade of Disney-style floats made its way through the city centre. 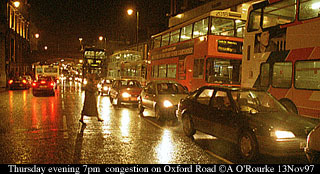 The streets are getting more and more hectic, as Christmas gets closer and closer. Nowadays the shops are open seven days a week, so talk of so many "shopping days to Christmas" is meaningless. On Thursday nights, the shops stay open late, and in the days leading up to Christmas, people will be able to make their last minute purchases until midnight at some large supermarkets. The days of regular 24 hour shopping can't be far off. Another feature of Manchester's streets this week and last week has been endless traffic jams, as I discovered during rush hour on Tuesday afternoon. Aytoun Street, which carries the Metrolink line between Piccadilly Gardens and Piccadilly Station, plus two one-way traffic lanes, was jammed solid, and despite (or more exactly because of) a failed attempt to short-cut the congestion, it took me an hour to get from half way up Aytoun Street to a point 30 yards further on. We only found out the reason for the chaos the next day - demolition work one and a half miles away to the south west. The section of the A57 between the end of the Mancunian Way and Regent road (near the junction with the A56) is about to be widened, and the Interarms building, which stands in the way, is being pulled down. Unfortunately, a wall fell outwards rather than inwards, causing Egerton St, a.k.a the A57, to be unsafe for traffic until the building is completely demolished. A week after the work started, the job still isn't finished, so it's another couple of days of gridlock for Manchester drivers. Despite the jams I found a neat way through to Salford this morning by cutting through Castlefield, past Dukes 92, under the railway viaducts and down Liverpool Road - I was on my way to Ash Street, Salford, which has been painted day-glo pink by Barbie manufacturer Mattel for "Barbie Month". Watched by the Mayor and Mayoress of Salford, an attractive, and very English-looking blonde-haired model played the role of Barbie, and posed, Marilyn Monroe-style, on the doorstep of one of the pink terraced houses, for a gang of press photographers. The residents are happy with the attention the painting of their street has brought, though I heard one of them saying the photographers ought to photograph the run-down houses on the next street. 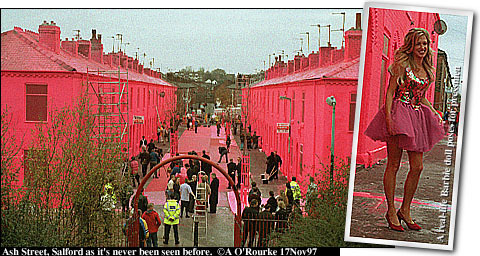 The Ash Street householders will receive some financial remuneration, and Mattel have donated £8000 to a local charity. The paint will be removed in two weeks. As I write, a special programme is in progress on ITV, debating the future of the North West. A majority of participants are in favour of a regional development authority for the region. A phone poll also revealed that two thirds of Londoners wouldn't like to move to the North West. There are mixed predictions for the future of the local economy. 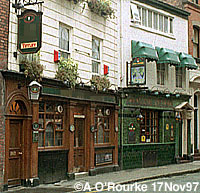 Last week's pub was of course the Briton's Protection on the corner of Chepstow Street and Lower Mosley Street. Congratulations to Steve Moran (matara@xpedite.com.hk) in Hong Kong and Steve Shnyder (steveds@sanger.otago.ac.nz) in New Zealand.